This week’s podcast is called “The Perfect Crime”: in it, Stephen Dubner describes a way to kill someone without any punishment. (You can subscribe to the podcast at iTunes, get the RSS feed, or listen via the media player above. You can also read the transcript, which includes credits for the music you’ll hear in the episode.) But let’s be clear: Dubner isn’t suggesting that anyone actually try this. In fact, the problem is that too many people are doing it already. So what’s “the perfect crime”? It turns out that if you are driving your car and run over a pedestrian, there’s a good chance — especially if you live in New York — that you’ll barely be punished. Why? We hear from Lisa Smith, a former prosecutor and now a law professor, who tells us that just 5 percent of the New York drivers who are involved in a fatal crash with a pedestrian are arrested. As it happens, New York has particularly narrow standards for conviction in such cases; there is a lot of variance among states. In New York City, meanwhile, pedestrian deaths make up an astonishing 52 percent of traffic fatalities. ZEGEER: The reason we don’t know is because the information we have to make that determination is essentially on police crash reports. And so oftentime the only witness is the surviving driver. And so the police officer only hears that one side of the story. This leads to a conversation about a core issue: who do the roads belong to anyway? You’ll hear from Robert Noland, director of the Voorhees Transportation Center at Rutgers; the transportation historian Peter Norton, author of Fighting Traffic: The Dawn of the Motor Age in the American City; the Harvard “urban economist” Ed Glaeser; and a couple of New York trauma doctors, Spiros Frangos and Stephen Wall. WALL: From our data, I think all pedestrians should be wearing helmets. But who would really want to wear a bike helmet when they’re walking, when they’re going out for a date, and that’s also the reason why they don’t wear them when they’re riding their bicycle. But there’s some truth to it. So why not just compare the number of people who DESERVE to be run over by state? I can think of a few. 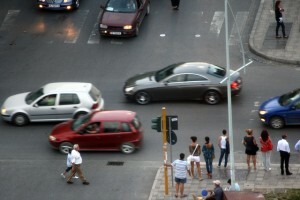 One thing to consider on the increase in pedestrian fatalities is this dramatic increase in the safety design of cars. If you look at the graph 2003 and 2012 end with ~4,700 fatalities. While the total fatalities has decreased. This is possible correlative evidence that with the advent of releasing engine blocks, side panel airbags, rotating wheel drive for slick surfaces, and the auto brake sensors have exponentially increased the value of life to the driver of the vehicle. Also, because of the steady rise in gas. The top heavy gas guzzlers have(had for awhile) been abandoned for the fiscal friendly sedan, which is half as likely to flip. While no new mass market technology has increased the value of life for pedestrian victims. I think the best way to reduce pedestrian would be something akin to the incorporation of the bullet train. Provide commuters on the outside of Manhattan a cultural hub that would regulate transportation in a manner as fast/faster than vehicle at the same cost. Because in the age of the affordable, safe, comfortable, and stylish car, it's so easy and inexpensive to implement mass transit options that people will actually use! Seems to me that pedestrian fatalities are making up a larger share of total traffic fatalities because cars are getting safer, and walking isn't. If you look at the data, the number of annual pedestrian fatalities hovers around 4700, from 2003-2012 while the total number of traffic fatalities decreases from 42000-33000. That tells me that for some reason there are 10k less non-pedestrian fatalities, so driving has become safer (probably due to improved safety measures on cars), while walking has remained at about the same level of safety. This may back up your point that pedestrians should start wearing safety gear if we really want to bring that number down. Driving has become safer... for car occupants. It hasn't become any safer for cyclists and pedestrians hit by drivers, the equation of kinetic energy is still the same, one half of mass times speed squared. Technology can't change that (though there are ways to mitigate it, like a pedestrian crumple zone to reduce acceleration during collisions). Technology has made driving more forgiving for car occupants by having their car protect them in case of a crash. But it hasn't made car drivers drive more carefully, only a culture change through policies prioritizing pedestrians and cyclists could achieve that. This totally applies in LA considering the amount of hit&run incidents in LA (which is an epidemic, especially amongst cyclists). You did not cover automobile designs to make them safer for pedestrians. These could be through redesign of bumpers, hoods and through crash avoidance like automatic braking when the vehicle detects imminent impacts w pedestrians (using IR or vision cameras). Europeans have taken the lead on such initiatives as well. Why are bicyclists asked if they were wearing helmets when they were hit by a car? How does that help us understand the causes of crashes? Very simple. The victims are blamed and this has been the case since automobiles "own the road." Automobiles certainly do not "own the road". Pedestrians have right of way on driveways, zebra crossings and walkways at controlled intersections. Legally, you mow them down at your peril. 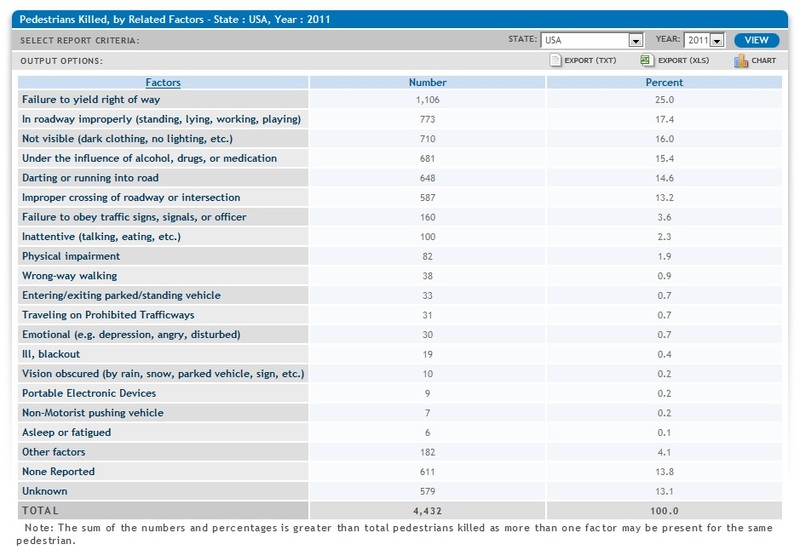 1) Looking at the ratio of pedestrian fatalities to all fatalities in New York has a major denominator problem. I expect that New York City has very few occupant fatalities by most reasonable measurements because there are very few places in New York City where cars can drive fast enough to have a fatal accident. (I was hoping to find a comparison of occupant deaths per mile, but could not do so). 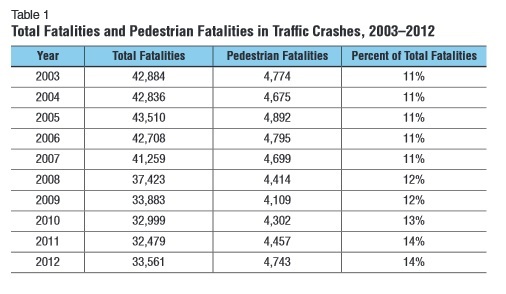 If you have very few occupant deaths, then pedestrian deaths are going to seem huge, even if New York City is relatively safe for pedestrians. 2) Killing someone by shooting a gun into the air is not comparable to killing someone in a car accident. When you shoot a gun into the air, even if you are not intentionally killing the person, you are still intentionally doing something tremendously stupid On the other hand, I suspect most traffic violations are not intentional, but rather a momentarily lapse of attention. The comparison does work with driving drunk, since there, you are choosing to do something stupid, but that is illegal. 3) It is unlikely that harsh criminal punishments would decrease the number of traffic fatalities. People don't fail to see a child crossing the street because they don't have sufficient incentives, they do so because they had a momentary lack of attention. Also, there are already substantial incentives for not running over a small child, including the wrongful death lawsuit you can expect for doing so and the lifetime of guilt, not to mention that the same sort of inattention that causes you to run over a small child also causes you to get into an accident that could kill you as well. 4) Saying that walking drunk causes accidents is not the same thing as saying people who walk drunk deserve to die. It is just saying that the thing that caused their death was their own negligence, not the negligence of the driver. The biggest improvement we could make to the safety of everyone in cities is to get rid of the crazy notion that the best form of personal transportation is a 2-ton farting metal box on wheels. Failing that, a serious safety improvement that would lower driver inattention substantially would be to ban seat belts and replace driver air bags with a driver flick-knife. I can't seem to download nor stream this episode. I'm technically literate and have tried three devices and three programs, including attempts to stream/download from the link on your site. I'm omw to take a tough biology final and really wanted it for my commute. I'll muddle through somehow ;-) and I'm sure it will get figured out! Love you guys! Thanks for what you do! They don't make it easy to download, do they? They want to steer traffic to iTunes where there's money to be made. For anti-dark side (that is to say anti-Apple) people who abhor iTunes: What works for me (in Firefox) is click on the RSS Feed link, right click on the Play Now link, and click Save Link As. The .mp3 is then downloaded. I'm not exactly sure how one "requires attention" when it comes to driving. Clearly a lot of the cause is negligence. It's humorous to me that in the wake of that NY commuter train derailment, the engineer of the train was immediately drug tested, phone records subpoenaed, and their license revoked baring review. Why is that also not the standard for driving related deaths? I'm going to stick to planes and trains for travel because at least if I die on one of those, my death would receive many more times the attention and scrutiny than if I were just bulled over by some SUV walking to get a sandwich. Also, the other sad truth ignored by the "freedom machine" lovers and dependents is that people who drive less or don't drive end up subsidizing the roads for those drivers on roads paid for by general revenue sales taxes. After all the regressive deductions and subsidies for the extra infrastructure required are summed up, it's amazing how the suburbs are the biggest moochers of tax dollars of anybody. I drive in NYC and I am astonished just how many people walk directly in front of my moving car, with the green light. The impatience of pedestrians, the use of cell phones while walking and the general expectation that cars will stop for you are contributing to these high numbers. Drive for one day NYC and count these instances...then it will become clear how these numbers skew so high.